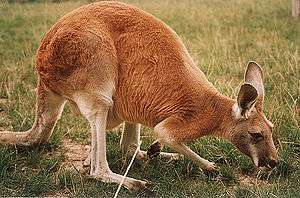 In zoology, a graminivore (not to be confused with a granivore) is an herbivorous animal that feeds primarily on grass (specifically "true" grasses, plants of the family Poaceae). The word is derived from Latin graminis, meaning "grass", and vorare, meaning "to eat." 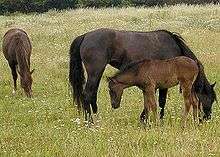 Graminivory is a form of grazing. Horses, cattle, capybara, hippopotamuses, grasshoppers, geese, and giant pandas are examples of graminivores. Some carnivores, such as dogs and cats, are known to eat grass occasionally. 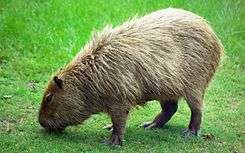 Look up graminivore in Wiktionary, the free dictionary. This article is issued from Wikipedia - version of the 3/18/2015. The text is available under the Creative Commons Attribution/Share Alike but additional terms may apply for the media files.